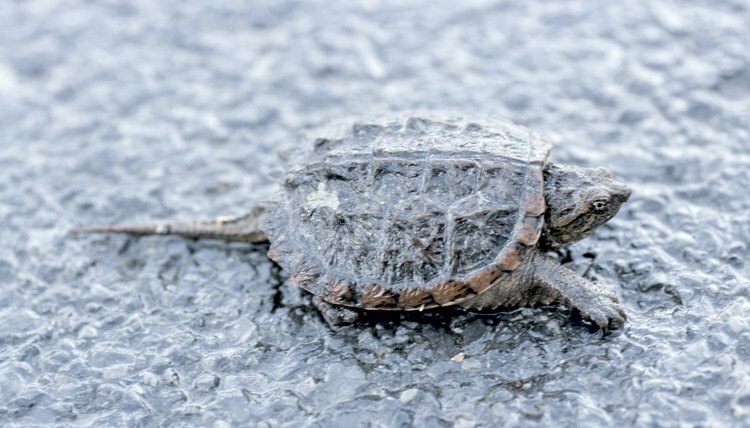 Snapping turtles do not protect their eggs or young. The mother leaves the eggs buried, and many snapping turtle eggs are eaten up by predators. Finding snapping turtle eggs provides you and your family with an exciting opportunity to help these turtles have a start at life. To protect the eggs, it is best not to bring them indoors. Instead, build a cage around the eggs. Leave the eggs in place. If you must move the eggs then do so carefully, taking great care to keep them right side up. Pound four stakes into the ground with a hammer around the eggs. You will want the stakes to be high enough so people see the cage and do not accidentally walk on it. The stakes should be at least eight inches. Staple chicken wire to the stakes so that the wire wraps around the stakes and is secure. This forms the sides of the cage. Bury the edges of the chicken wire to discourage predators from digging under the screen. Place leaves inside the cage. This will give the hatchlings something to hide under. Lay a piece of chicken wire on top of the cage and secure it with twine to the sides. Plant marigolds around the cage. Fully grown marigolds put off an unpleasant smell and taste that most animals do not like. Planting them around the turtle cage will help keep predators at bay. Check the eggs daily. The mesh from the chicken wire may not be big enough for the hatchlings to get through. Release the hatchlings during a rainy night; this will give them a better chance to make it to safety. How Do I Keep Abandoned Snapper Turtle Eggs Alive?